This soft, lovely template is perfect for the romantic at heart, and features four pages ready for your content and customization to suit your needs and taste. 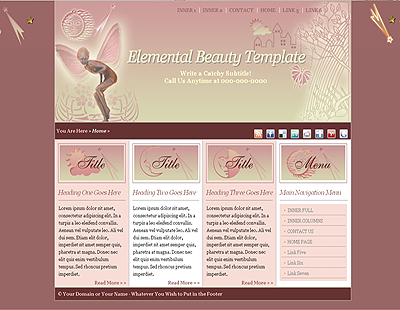 We offer this unique ethereal template to match your vision and philosophy to present your content with savvy and style yet in an aesthetic and unique way. Includes a main entry page, two inner pages to replicate for your various pages, a contact page, fonts, PSD images, HTML and CSS files. Everything you need to design a stylish and alluring website.